The decision on merger of HLP (Himachal Lokhit Party ) and Maheswar Singh chief of HILOPA with BJP will be decided by High command . Sources said after BJP core group meeting in chamba that merger of Himachal Lokhit Party was not discussed in meeting. Who was present in core group meeting? BJP Core group meeting in chamba was attended by state big leaders like Kangra BJP MP and former chief minister Shanta Kumar, Leader of opposition and former chief minister prof. Prem Kumar Dhumal, Expected BJP cm candidate and central health minister JP Nadda, MP from Hamirpur and BJP yuva morcha president Anurag Thakur and State BJP president satpal satti. A member of core group said that final decision on merger of HLP and Maheshwar singh in party will be decided by high command of bhartiya janta party. Sources said BJP leaders from kullu were opposing entry of Maheshwar singh and HILOPA in BJP, on the ground that Maheshwar singh leader and he will cut there clout in the party in kullu district. Voices of dissents are getting louder in HLP's led by Mahender sofat, sharam chand guleria and subhash sharma etc. They are saying HLP as third front in State. Maheshwar singh is fighting battle for political survival as he had ties with BJP in 2012 election and supported Virbhadra Singh in assembly. BJP had labeled HLP as Virbhadra's b-team. 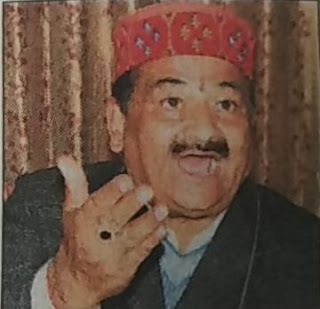 Maheshwar and Virbhadra Singh's honeymoon time ended when Virbhadra Singh inducted karan Singh ,Maheshwar Singh's brother as Ayurveda minister in his cabinet. Maheshwar singh is supposed to be close with expected BJP CM candidate JP nadda. So it will be interesting to see what happen next in case of Maheshwar singh.